By the way, is it normal that i play on 2 fps in that room? I deactivate 2 mods and then it goes up to 40 fps. Having lot of items in a container isn't supposed to make the game lag, suppposedly, so what's the problem? Any way to fix it without removing any mods i want to try? What are those mods that cause the massive framerate drop? AG Supplementary Uniques and Millenia Weapons pack. Amazing mod to test stuff, i know that Fallout 4 is a bad game but... could you make a similar mod for it? That would be very nice! Sorry, but I don't make mods for that game. I wouldn't even know how. It's kinda similar, but the Creation Kit for Fallout 4 is certainly different to use. If you decide to work on it someday, i'll certainly download it. I'm not sure what it is about version 1.90, but it makes my game incredibly unstable no matter where I put it in my load order, and regardless if I have a merged patch active or not. I crash pretty much any time I enter a loading screen for any reason. Version 1.80 works perfectly fine though. I don't understand why, because very little is changed between versions 1.80 and 1.90. Are you absolutely sure that it's this mod that's causing it? 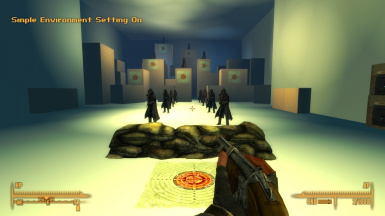 Are you trying to run TestShootingRange.esp and TestShootingRangeNMS.esp simultaneously? You're only supposed to have one of those running at the same time. If not, then have you tried seeing if this issue persists if you start a new game? No, I was only running the default version. Anyway, I found out your mod isn't causing my problems. Was still having issues with both versions disabled and couldn't even make it out of Doc Mitchell's front door after starting a new game. I just disabled a bunch of mods that I don't need to test my weapon mods and the problem went away. This lighting you set up in this cell is *really* nice for checking my textures in the game. Much better than NV's outdoor lighting and most interiors are too dark to see anything. 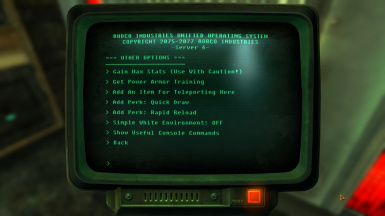 - You don't need to check for the preorder files' mod index, they inject all their stuff into FalloutNV.esm, so their index is 0. - You can even separate armors further. There's GetArmorClass and IsPowerArmor, plus maybe separate "accessories" which don't go in the torso slot, I think checking for GetEquipType != 7 should be enough. - Do targets have 50 hunting rifles for some reason? They don't equip another one when you knock the one they have in their hands, and it remains on their back weirdly rotated. Well that's enough already I think. Thank you again! I deleted the unnecessary preorder bits from the scripts, and made sure that the targets cannot drop their guns anymore. Also added some other handy options I thought of. However, I unfortunately had to forgo doing anything about the armor container. Dividing it into classes I felt would confuse things too much, and for some reason the game was refusing to separate armors and headgear into separate containers - as in it was just outright ignoring GetEquipType != 7 and was sending everything to the "else" container. You know since you can teleport to this cell from anywhere in the game, would it be possible to teleport back to where you were? Version 1.5 I just released expands the functionality of the teleportation item to allow returning to where you set up the return spot, as well as some other things. Umm...I just tried this in DUST mod, and it doesn't teleport me back to the return spot, exit is still doctor mitchell's backyard. So what exactly is happening when you try to use it? And does it work as intended without DUST installed? and actually one more thing, when I pressed the revive all button on the terminal, every npcs including the ones that are still alive all disappeared and none of them respawn. Then my game freezes and I had to alt tab close it. Were you using any other target-related options (like giving them different armor or changing how many of them are supposed to be present), and have you been doing anything specific before this happened? The option seems to be working just fine on my end and I'm not seeing anything that would cause the bug. no didn't use anything else on the terminal. So after I got in, I shot some targets with my equipped weapons, including a grenade launcher, there were only a few targets on the very top corner still alive, then I dropped my weapons and disabled them using console command. I also picked some fanmade weapons and that's it. Edit: So I just found out my lastest saved game stopped exactly where I crashed last time. When I load it, targets respawned, I'm using RX auto incremental save, it automatically save my game in every one minute. - Are NVSE and JIP LN NVSE Plugin both installed and up-to-date? - Is Stutter Remover installed, and if not, then does installing it help? - Does your computer meet the game's requirements? If none of that helps, then I'm afraid I'm clueless, and the best I can do is provide a "Use With Caution" warning on the option, since I don't know what can possibly be wrong. Nope not every time, also I should rephrase it as freeze not crash, I had to alt tab to end process, maybe nv just being unstable. Anyway love your mod, saved a lot of trouble finding stuff in the editor. It would be a lot better if you added in some type of "transporter" that allow people to transport there at any time. It would be a lot quicker that way than just having to plan how to get back to goodsprings every time whether console commands,walking or fast travel, just to test a weapon out. I also noticed heavy lag in the room, so adding an option or making them unarmed natively without making game render in the guns, should save some frame rates. Another way to increase fps would be leaving it up the user how much targets we want or maybe taking away the extra cosmetic objects that's not needed. The fps defiantly had a big increase. I was surprised their wasn't an menu asking to get the transporting item added to the inventory when first loaded.. You could try making the item to transport there be some kind of item drug that mentally transports the person into this shooting range full of all the guns they wanted. That could help a bit for the people looking for some type of lore explanation. a lot if not the majority is most likely gonna use this to test weapon mods rather than the vanilla weapons, so maybe you could add a separate locker or lockers for modded weapons. I added a prompt asking if the player wants the item added to their inventory. 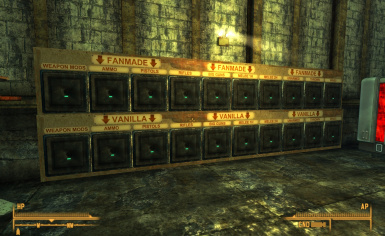 Also divided the containers into ones that contain vanilla items and ones that contain modded items. You did a good job at polishing it. There needed to be a mod like this. Hopefully it gets mod of the month. I highly doubt it will, seeing how nobody seems to have voted on it as the file of the month. It would be lovely though. Actually, being able to change their health and DT/DR would be very helpful. I don't think terminal give sliders, so you could make health go up by the 50's until the max of 500 or maybe 1000 (just in case). DT/DR should be able to be increased by either 10's until 90 or 5's until 95. 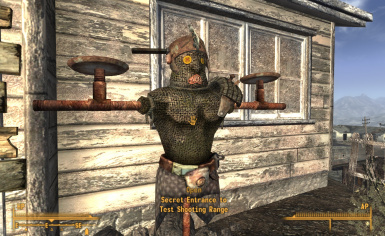 It would also be an helpful addon to be able to test weapons against some of the low quality armors like leather/raider and some of the high quality top armor armors like Combat and Power Armor or even different faction armors like the NCR and Legion like an template system, so an option to outfit them in these Armors would also be helpful to test realer situations with people with common armor and rarer protecting them. You could try replacing the "targets" with people from the different factions as an alternative instead. Should be the last things it would need. I included an option to increase the targets' health and to change their armor. "You shouldn''t be leaving while any of the targets are dead" popped up. I tried to use the clear option in the terminal but still can't leave. Did you make sure to press Enter a few times? If yes and that doesn't bring them back, then do you have NVSE and JIP NVSE Plugin all installed and up-to-date? That worked. I was just trying to get out and press E on the dummy where I came in, weird "press E" doesn't work if I try to get out. Using Enter to revive the targets is one of the crucial features of this mod, so I added an explanation to the message to hopefully avoid any further confusion on that front. Also I added a way to bypass the message altogether in the event of something breaking completely for no apparent reason. Thank you for this! I was using a trashy mod for this kind of stuff, placing some containers in TestJoshWeapons, having to coc there and spawn test dummies every time I wanted to test things out wasn't exactly comfortable, but I could never be bothered to make something as elegant as this. May I suggest an improvement, since you use JIP LN? GetLoadedTypeArray (GLTA) is amazing because it really allows accessing any kind of item present in your game. Your suggestion is definitely a big improvement. It seems to work fine for the most part, except for one issue... it's very performance-intensive, presumably because the script never stops looping through all the weapons over and over again. Do you think there is a good remedy for this? EDIT: Nevermind, I managed to figure it out with the help of others. This could be useful, as I'm testing out different mods and guns in the game. It's easier than having to hunt out geckos, Powder Gangers, and death claws. 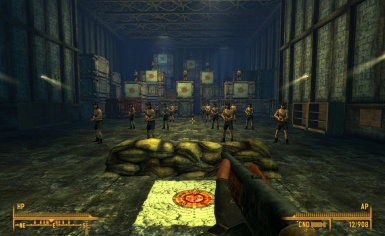 It would be interesting to add some lore to it, like it is some hidden area from an earlier time before the nukes. Thanks, a word of encouragement was what I needed. 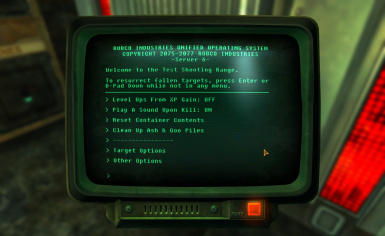 I doubt that this shooting range can be explained in a lore-friendly way, given that it's meant to be a convenient tool for testing first and foremost, especially considering the various cheat-like features it has. It's probably best to keep it that way for ease of use.